Microsoft announced earlier this year that its popular SharePoint collaboration software was getting a full-featured mobile app. Starting Tuesday, iPhone users can take a crack at it. The SharePoint mobile app brings the key features from the popular enterprise collaboration software to users' smartphones, so they have an easier time of accessing things like company bulletins, SharePoint applications and shared workspaces while on the go. That's important for Microsoft, since launching a mobile app makes SharePoint more relevant for a workforce that is increasingly trying to access work data on their smartphones. It's facing competition from multiple angles, with different companies coming in to challenge Microsoft's dominance of the productivity software space. When people first open the app, they'll see three main tabs: Sites, Links and People. The Sites tab gives users access to all of the SharePoint sites that they're a part of at work. They can see recent activity, files and posts from a site, and then open a menu to access all of the content stored in it from their phone. The People tab, as its name implies, lets users look up their coworkers, view their profiles, see what they've been working on and who they've been working with. Microsoft is using its Graph API to populate the last two sections, so that people see information that is most relevant to them, based on how they work. Using the Links tab is pretty straightforward. It just pulls together important links for users to click on, getting them quick access to whatever matters to them like expense tracking portals, shared calendars and the like. It's all tied together by a search feature that lets users find sites, files and people across their company's intranet, SharePoint team sites and OneDrive folders available to them. The search feature uses Microsoft's Graph to provide recommendations about what content is most relevant to users, so it's easier for them to find what they're looking for. Of course, the app's success is incumbent on organizations buying into SharePoint for their internal collaboration. But, it's an important step for Microsoft to compete with a host of other enterprise collaboration companies, including Google, which recently announced a pair of services that compete with SharePoint. 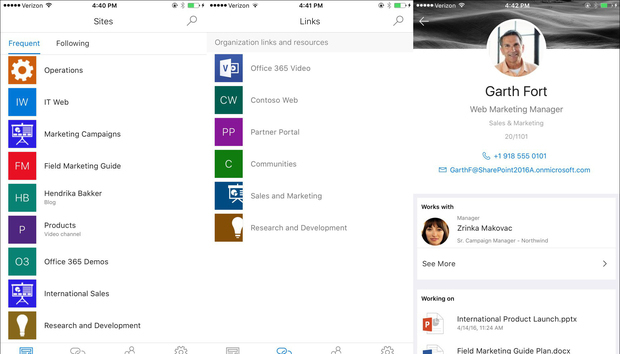 The SharePoint mobile app will work for Office 365 users at organizations using SharePoint Online, as well as companies using SharePoint Server 2013 and 2016. Right now it's available for iOS, but Microsoft says that versions of the app for Android and Windows will be launching later this year.